The OEM Printer Drivers version 13.06 will include a programmatically fully controllable email module. 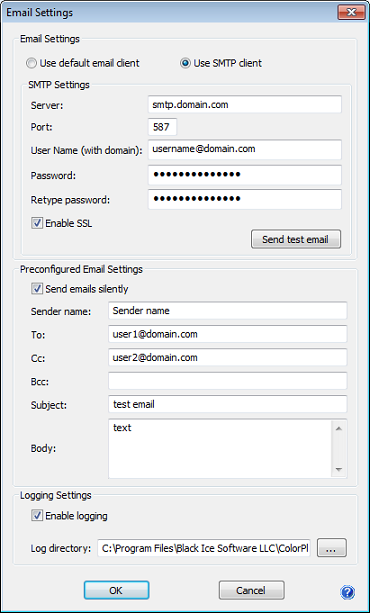 The new Email Sender utility supports SSL encryption, custom SMTP server settings and includes a test email option. Also predefined recipients can be specified to send emails without user interaction. The Black Ice printer drivers can be configured to use a developer defined group of settings at installation time by using the INI file associated with the driver. Settings specified will be used to configure the Black Ice printer driver as the default settings for any user on the system. When a user clicks the restore defaults button on the Printing Preferences of the driver, the Printer Driver reverts back to the INI file settings. The INI file for each Black Ice printer driver is located in each install sample found in the \Install folder of the RTK installation. The Email Sender utility settings can be found under the Email in the INI file. The DEVMODE data structure contains information about the initialization and environment of a printer device. The BlackIceDEVMODE DLL and OCX are designed for developers to retrieve or modify the settings of the Black Ice printer using C, C++, C#, VB.NET or Delphi programming languages. Both the DLL and the OCX are contained in the Resource Toolkit. The Resource Toolkit contains an Install Shield and other install samples to demonstrate how to build a new Printer Driver installation. When distributing the Black Ice Printer Driver with the Email Sender utility, the PDEmailSender.exe should be added to the install project. The printer driver INI file needs to contain the full path in the Email Sender utility value. The Printing Preferences dialog shows the Email Settings control by default. These UI elements can be disabled so that the users cannot change or enable these settings on the User Interface. To disable or hide these UI elements, the resource dll needs to be modified. Security settings are important for protecting the PDF document’s sensitive information. If the PDF files are encrypted and secured, you can choose what others can and can't do with your PDF documents. Document viewing, printing, editing, and copying can all individually be turned on or off. This will offer a great deal of control in protecting sensitive information. NEW! : Secure PDF documents using 40-bit or 128-bit RC4 encryption. Restrict unauthorized users from viewing, printing, editing, and copying content from your PDF files. Password-protect PDF files, requiring users to enter a password to open or edit the file. 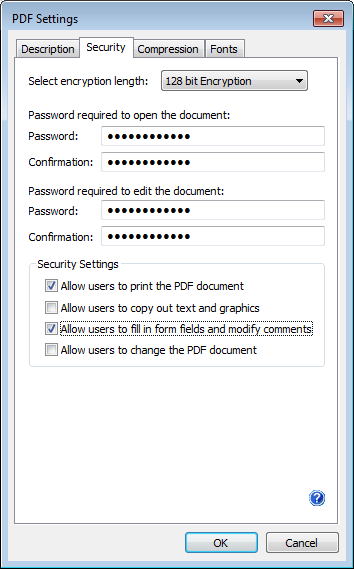 PDF Security settings can be configured under the Security tab of the PDF Settings dialog. Black Ice Printer Drivers support a wide variety of paper sizes. The page sizes range from envelopes to large E size pages. There are 86 standard paper sizes, as well as a Black Ice Software specific FAX paper size. 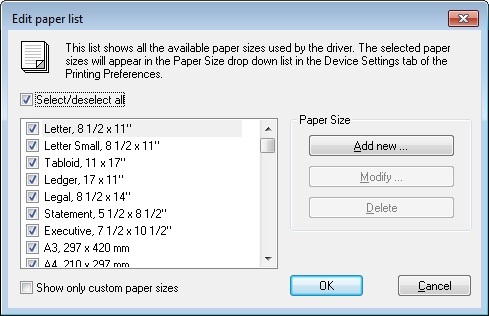 Edit Paper list option enables customization of the paper size list used by the Black Ice Printer Driver. The user can add new paper sizes and modify the availability of existing or custom paper sizes. How to change the registry path of the printer driver variables in the MSI install? When installing the Black Ice printer drivers (using MSI install) the installer should save some information into the registry (e.g. driver name, printer name, port monitor name etc.). The install and uninstall dll needs these pieces of information to install/uninstall the printer driver. In case of a 64-bit printer driver basically these values are saved at HKEY_CURRENT_USER\Software\Black Ice Software LLC\[printername]\ PrinterVariablesValues. However, the registry path can be changed if necessary (for example when using a custom company name or HKEY_LOCAL_MACHINE instead of HKEY_CURRENT_USER). The registry path should be changed in the InitializeMSIVariable function of the install dll. The registry path should be changed in the StartUninstallMSI function of the install dll. How to change the path and name of the email sender and SharePoint Uploader with a custom driver installation? The Black Ice printer drivers contain two utilities: SharePoint Uploader and the Email Sender. The SharePoint Uploader can be used to upload the printed documents automatically into a SharePoint repository. The Email Sender can be used to send the printed documents in an email. If the printer driver doesn’t use these functionalities the installer doesn’t need to install these utilities. The path and the filename of the utilities can be changed. The printer driver starts the utilities specified in the INI file. Note: The email sender has a 32 and 64 bit version. The printer driver launches the 32-bit version if a 32-bit MAPI email client is installed on the target machine. The printer driver launches the 64-bit version if a 64-bit MAPI email client is installed on the target machine (for example the 64-bit version of the Microsoft Outlook).